What exactly is the GOBACKPACK promotion? We know that you would like to travel, but we also know that money can sometimes be tight. That’s why we want to make your next adventure easier by providing you with your equipment. All we wish for in return is to see your travel story in the form of a video. In return, we will give you a refund for the most expensive Jack Wolfskin product you purchased from us during the campaign period (1. May 2018 – 31. October 2018), but not more than 200 EUR/250 CHF/150 GBP. We looking forward to receiving your video. What requirements does my video need to meet so that I receive a refund of the purchase value up to a maximum of 200 EUR/250 CHF/150 GBP? The video should not just show one situation, but different experiences from your trip too – not just your front garden! It’s important that it was created by you and that the GOBACKPACK flag is on display. You must film the video within the campaign period (01 May 2018 – 31 October 2018) and your video must be one of the first 500 submissions. Maximum file size: 1.5 GB, length of the video: at least 30 seconds, format(s): all standard video formats such as MP4, MOV, MPG, AVI, WEBM, OGV, resolution: HD. You can find lots of example videos on our website too - www.go-backpack.com. How do I know how many videos have been sent in so far? On our website www.go-backpack.com, you will find a countdown, which shows you how many refunds are still available. What music can I use for my video? Generally speaking, you may only use GEMA-free music. You can use Google to find suitable music, or simply use the music . Where can I get a GOBACKPACK flag? The GOBACKPACK flag is available from all Jack Wolfskin stores in Germany, Austria, Switzerland, the Netherlands, Belgium and the United Kingdom, as well as from our partner Globetrotter when you buy a product and while stocks last. If you would like to participate in our promotion, then simply speak to one of our members of staff. In addition, you can add them to your basket at no extra cost in the official Jack Wolfskin online shop when buying a product. Please note that we cannot accept registrations made using receipts from other merchants (Intersport, Sportscheck, Amazon, etc.). I didn’t get a flag when I made a purchase. Why not? How can I still get one? Oh, we are very sorry that you didn’t get a flag! Our members of staff are doing their best, but they may just have forgotten it in your case. You can either go to the store and ask for a flag, or you can place an order online and add the flag to your shopping basket. It will be offered to you free of charge when you open your shopping basket. There are a limited number of flags available. Why do I need to enter my bank details? After reviewing your video, we will transfer the purchase value up to a maximum of 200 EUR/250 CHF/150 GBP back to your account. We need your bank details for this. We will only use your details for the purpose of this promotion. How long does it take for the amount to be paid into my account? Processing can take up to 6 weeks (14-day right of revocation period plus a 14-day period in which the product can be returned, incl. processing time). Can I track the processing status of my video anywhere? Unfortunately, the status cannot be tracked because each submission has to be checked individually. However, you will be informed about the process by email and will get information as soon as your submission has been reviewed by us and the money has been transferred. I have sent in my video, but I do not wish to take part. How can I withdraw my submission? 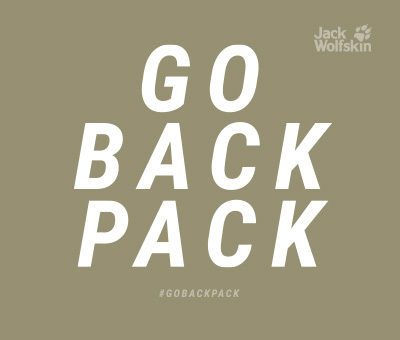 Simply send an email to gobackpack@jack-wolfskin.com and outline your issue. It will be our pleasure to assist you. What happens if I wish to return the products I bought when I received the GOBACKPACK flag? No problem. Your details are stored in our till system when you get the flag and we will update your purchases, returns and cancellations. However, if you have only bought one product and returned it, you can no longer participate in our GOBACKPACK campaign. We only pay out amounts that have previously been paid for Jack Wolfskin products. What happens if 500 participants have already been refunded their amount? Unfortunately, we cannot pay out any more amounts, but we will still be delighted to receive your video(s) and will think of something nice for you as a "thank you". I bought two products at different times. Can I enter twice? Since we only have 500 cashbacks to hand out, but at the same time wish to give as many people as possible the chance to participate, we have decided to limit participation to one registration per person. Can all my family members enter individually? There are absolutely no restrictions in this respect. We will be delighted if you encourage your entire family to take part. It is important, however, that the videos are not identical and fully meet the criteria. What happens to my video after I have sent it in? We will check your video to make sure it meets the criteria detailed above and then upload it to our GOPACKBACK site (www.go-backpack.com). You can find further information in our General Terms and Conditions. Which products can I get a refund for? In principle, you can get a refund on all Jack Wolfskin products. We will pay for the most expensive product in your shopping basket, but a maximum of 200 EUR/250 CHF/150 GBP. During what period of time do I have to purchase my product in order to be able to take part in the promotion? Your purchase must have been made between 01 May 2018 and 31 October 2018 for you to be eligible to participate in the GOBACKPACK campaign. I purchased my product outside of the scheduled campaign period (01 May 2018 until 31 October 2018). Can I still take part? Unfortunately, we have to draw a line somewhere and cannot process your submission. But you are very welcome to buy another product during the scheduled campaign period and still participate in our GOBACKPACK promotion this way. Why was my video declined? If your video was declined, this means that it did not meet the necessary criteria. However, we will always send you a personal email explaining why it was declined. All standard video formats such as MP4, MOV, MPG, AVI, WEBM, OGV. What is the maximum size that the video can be? What resolution does the video need to have? It is best to send us a high resolution video in HD quality. If you have any questions about the process, how it works or any other problems which are not mentioned in the list, feel free to get in touch at gobackpack@jack-wolfskin.com.